Under grey skies with the promise of much needed rain, the Ojai Rotarians and their guests assembled in the Soule Park Clubhouse for fun, food, and fellowship. President Daly, who is proud to serve as President of the best Rotary Club she knows opened the festivities. You’ve blessed us with friends and laughter and fun. There were many guests and Visiting Rotarians. Unfortunately, the guest sign in sheet was not picked up. Apologies to all. Coming Up--Bill Prather gave us a rundown on upcoming programs. The Program Committee has done a yeoman’s job in consistently providing informative and uplifting programs this year. Thanks to all! April 6th--Rotarian at Work Day at the Ojai Demonstration Gardens. April 24th—NHS Job Fair—Contact Bryant Huber for further information. Deirdre reported on the District Midterms which were attended by Deirdre, Therese, Nathan, and others in Bakersfield. Tony O’Thacher regaled us with a bit of humor in honor of our President. To the sound of one hand clapping, Therese took the podium to extract ducats from the assemblage. Mike Weaver celebrated his birthday. Don Reed’s son who has an MFA in creative writing has recently been published. Suzanne confessed to 20 years of wedded bliss. Janet Campbell’s daughter in law and son, Justin is pregnant with Janet’s first grandchild. The theme was ancient inventions and technology. Bryant Huber, Ian Maclean, Marty Pops, Mike Malone, and Bill Gilbreth were grilled on everything from Chinese chemistry, silk making, and initial uses of the compass. Thank-You, Therese for a lively session! Mark Whitman introduced Bryant Huber, who spoke to the current technology in extracting water from thin air. In these times when the availability of potable water is becoming scarce for many people in the world, this is becoming a viable solution to the shortage. Bryant thanked Tara, Mark, Sandy, and other Rotary members for their support. Bryant has been researching this concept for the past 2 years. That’s a lot of Googleing. An UN study in 2012 revealed that African women spend 200 million hours a day or 40 billion hours a year in providing drinking water for their families. The average distance traveled for water is 3.7 miles, often traveled several times a day. Some travel 20 miles a day for water. This time could be used for productivity, education, and general betterment of the people. With the drought, the need for more water is closer to home. There are many people working on this solution. 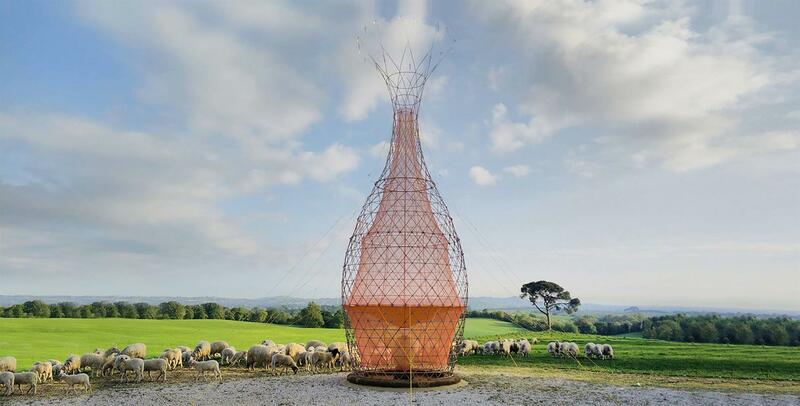 The Warka Tower—A 20-30 foot bamboo frame with a nylon net that captures and funnels water which is channeled to a terracotta pot at the bottom. Invented by Arturo Vogler, an architect is simple in design and inexpensive. It takes about 6 people to build the tower in 3 days. It is susceptible to wind and takes time to build. It would provide enough daily water for a family of seven. The Cloud Fisher—An ultrafine netting in a rugged frame, it can stand up to 100 mile per hour winds. It can last up to 25 years. It can produce 100s if not 1000s of gallons of water daily. An instillation in Morroco produces 8000 gallons of water a day. It is expensive and requires skill and tools to install it. Air Drop System—This system utilizes a fan, powered by a solar panel, and coil technology. Utilizing nanotechnology, it channels water into drip lines to irrigate crops. It is portable, easy to install, but is very expensive. Its output is not dependent on fog or rain, but the output of water is small. Other Units include the Sky Water and Rain Maker. Bryant wrapped up the talk with what would be required to utilize these devices as a service project and what the local government would require for permitting the projects. Thanks, Bryant for an interesting and informative presentation! Every human should have the idea of taking care of the environment, of nature, of water. So, using too much or wasting water should have some kind of feeling or sense of concern. Some sort of responsibility and with that, a sense of discipline.